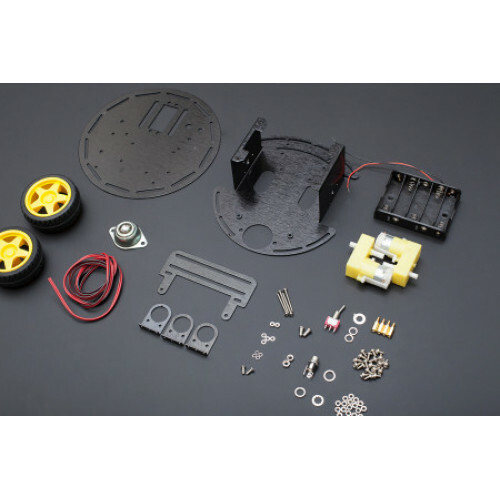 The 2WD Mobile Robot Platform for Arduino is a small, low-cost mobile platform for use with a standard Arduino microcontroller. The robot comes as a kit which includes two drive motors, wheels (and rear caster ball), frame and all mounting hardware. The main structure and mechanical parts for a robot. 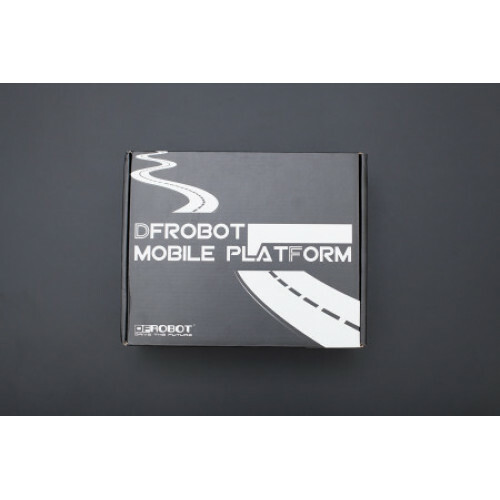 This DFRobot mobile robot platform is widely used as self-developed control chasis for Arduino platforms and other control boards. 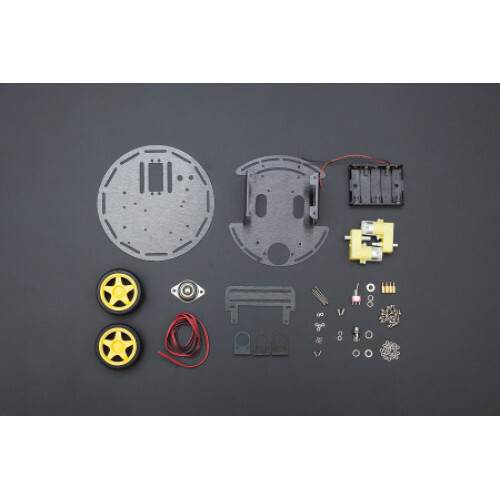 This kit features the following: two differential drives, near zero turning radius, high-strength aluminum alloy body material, motors and a flexible rubber wheel makes it suitable for indoor flat road surface and flat-platform robot completitions. The top layer includes a standard servo socket and the three optional sensor holder. This three sensor holder fits with our adjustable IR range sensor. 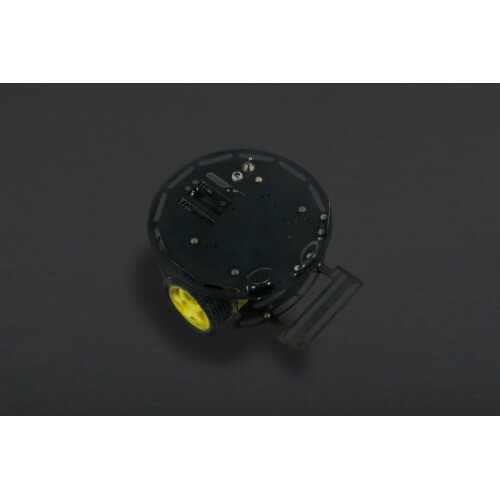 The servo can be used for a simple rotation platform, a two degrees of freedom camera holder or even a robotic arm. To make this lovely robot run, you will need a motor controller and microcontroller board. Our Romeo V2-All in one Controller is an ideal candidate for this, it includes an Arduino compatible platform directly programable via USB, a motor controller with external power option, integrated optional buttons and sensor connection sockets like our famous expansion shields. 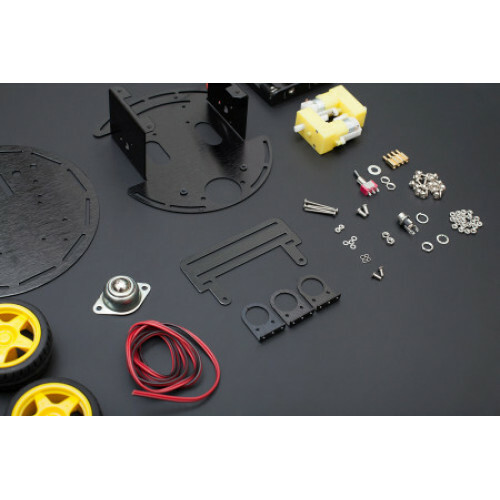 This mobile robot platform is in Michael Margolis book "Make an Arduino-Controlled Robot".